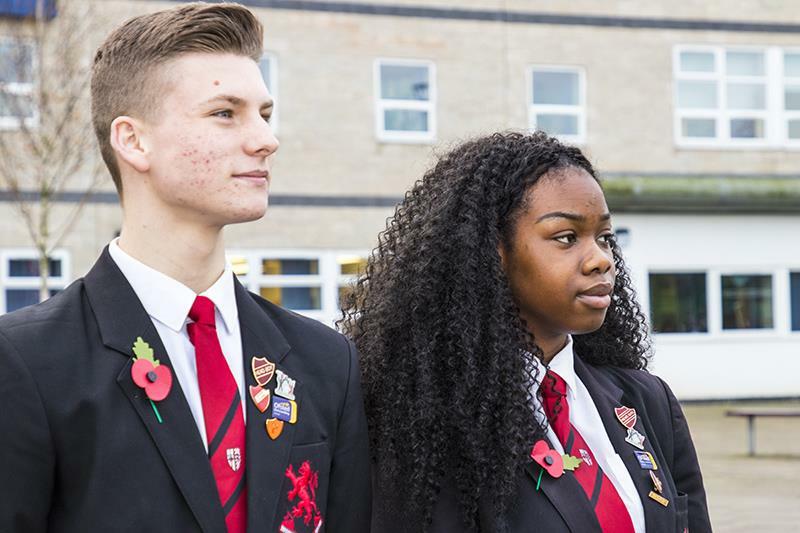 Every pupil at Wright Robinson College wears a smart red, white and black badge with the words “Team Wright Robinson” emblazoned across it. The three words embody the ethos of this high achieving school in Gorton, on the east side of Manchester. Teamwork is embedded through everything the school does, from the students’ behaviour to their attainment in the classroom and on the sports pitches. Headteacher Neville Beischer introduced the Team Wright Robinson concept into the 1,800-pupil school in 2013. Inspired by Team GB’s success at the London 2012 Olympics, when sportsmen and women won a record 65 medals, the school’s senior leadership team hit on the idea of using teamwork to improve the college’s academic performance. “The college has long understood the benefits that involvement in sport can bring to individuals, but more specifically the power and momentum that teamwork can bring to engage people and teams to improve their performance in sport,” explained Mr Beischer, who has been head of Wright Robinson College for 27 years. “However, it was not until 2012 that the idea of teamwork being used to improve whole-college academic performance was floated. The teamwork concept quickly took off. One of the school’s media technicians designed the eye-catching Team Wright Robinson badges, pictured below, which are presented to all year 7 pupils during assembly. The badges are worn on the left lapel of their blazers – “because it’s closest to their heart and Wright Robinson is in their blood”, said Mr Beischer. 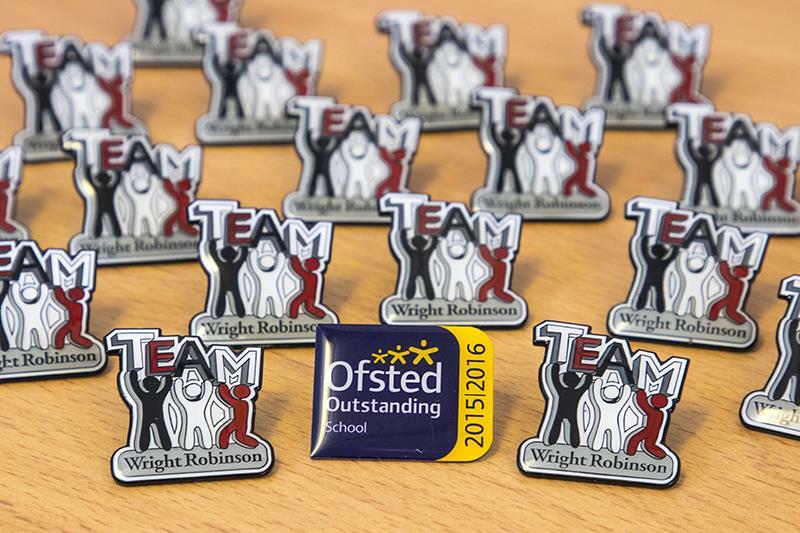 The teachers and support staff all wear the badges too and every classroom has a Team Wright Robinson placard on display. Incorporating the teamwork ethos into all aspects of school life has resulted in rapid school improvement. In 2011 and 2014, Ofsted inspectors had told the school that it required improvement. However, in 2016 Ofsted judged Wright Robinson, which is located in a diverse, inner-city area and where 60 per cent of students are eligible for Pupil Premium funding, to be outstanding in all areas. Five years after Team Wright Robinson was launched, the school is one of the most popular in Manchester, with more than 900 applications for 360 places in 2018. Wright Robinson’s Progress 8 score in 2016 was 0.30 and 0.46 in 2017, putting it in the top 18 per cent of schools in the country. Student attendance is 96.2 per cent, above the national average of 94.6 per cent. The pupils learn that with a combination of hard work and self belief they will achieve their potential. Not surprisingly, they are huge supporters of Team Wright Robinson. “It has really helped me,” said head girl Esther Adetiloye, who is in year 11 and has ambitions to specialise in stem cell research when she is older. The teachers have embraced the concept of teamwork as readily as the pupils. Nicola Parsons, who started her teaching career at Wright Robinson as an NQT 15 years ago and is now head of modern foreign languages, believes that the whole-school approach to teamwork is key to its success. Mr Beischer himself believes that part of Team Wright Robinson’s success is due to the fact that the students can identify with it. During the school’s Ofsted inspection in 2016 the lead inspector told Mr Beischer that over two days at the school she and the other six inspectors had only seen one instance of what they initially assumed to be bad behaviour. Mr Beischer and the teaching staff are frequently complimented on the pupils’ behaviour. “People always comment on the standard of conduct, the standard of behaviour and the pupils’ uniform,” he said. “You’ll never see a shirt out in this school, or a tie that’s undone. We’ve tied the importance of manners and the common courtesies of ‘good morning’, ‘good afternoon’ and ‘how are you?’ into teamwork. It’s become a way of life here. Unusually, many of the pupils apply to be a prefect in their final year at Wright Robinson, keen to lead by example and help the head run the school. As a result, there are currently 270 prefects out of 320 year 11 pupils. The ability to work as part of a team is a valuable skill for the workplace too. Research published last year by the Duke of Edinburgh’s Award found that 95 per cent of UK senior managers regard soft skills as equally or more important than exam results alone, with 98 per cent recommending that young people should invest more time in enhancing skills like communication, teamwork and leadership. “One of the qualities that employers want is the ability to work as part of a team,” said Mr Beischer. “I feel that teamwork is such a powerful force for good yet it’s so sadly neglected and I can’t understand why. It’s a concept that’s easily and readily understood by young people and it makes such a difference.